Im Abonnement enthalten ist ein kostenloser Online-Zugang zum aktuellen und zu allen seit 1990 erschienenen Jahrgängen. Zusätzlich können Abonnenten die kostenlose App 'Quintessence Journals' nutzen. In neuem, zeitgemäßem Layout und Design setzt QI ihre in Jahrzehnten bewährte Tradition fort, den Generalisten mit klinisch relevanten, wissenschaftlich fundierten aktuellen Beiträgen aus allen wichtigen Bereichen der Zahnmedizin zu versorgen. Eli Eliav und sein Redaktionsbeirat fühlen sich mit der Präsentation hochwertiger Forschung, nützlicher klinischer Verfahren und kurzer exemplarischer Fallberichte und Notizen praktisch tätigen Zahnärzten auf der ganzen Welt verpflichtet. Als ihre vordringlichste Aufgabe sehen sie die rigorose aber konsequent zeitnahe Begutachtung der Manuskripte, um stets eine hochaktuelle, repräsentative Auswahl qualitätvoller Artikel aus der Vielfalt zahnärztlicher Disziplinen und Spezialisierungen zu präsentieren. • Mit kostenlosem Zugang zur Online-Version recherchieren Abonnenten komfortabel online - auch rückwirkend ab 1990 im Archiv. • Kostenloser Zugang für Abonnenten zur App-Version. Objectives: This review was undertaken to answer a controversial clinical question with high-quality evidence: When severely damaged teeth are restored, which type of post (metal or fiber) demonstrates superior clinical performance? Data sources: The meta-analysis was conducted according to the guidelines in the Cochrane handbook. Electronic databases (MEDLINE, EMBASE, CENTRAL) and gray literatures were screened up to January 2018. Only randomized controlled trials (RCTs) with follow-up of at least 3 years were included. The quality of included studies was assessed by the Cochrane Collaboration's tool. Meta-analysis compared survival, success, post debonding, and root fracture incidence of teeth restored with fiber and metal posts. The GRADE system (Grading of Recommendations, Assessment, Development and Evaluations) was used to assess the strength of the evidence. Of 1,511 records, 14 full texts were obtained. Only four RCTs with follow-up times of 3 to 7 years met the selection criteria. The methodologic quality of included RCTs was low risk of bias. Fiber posts presented significantly higher survival rates than did metal posts (RR 0.57, 95% CI: 0.33 to 0.97, P = .04), while no difference was observed in success rates, post debonding rates, or root fracture rates. The GRADE assessment indicated a high quality of evidence for survival rates and a moderate quality for success rates. Conclusion: It was concluded that fiber posts displayed higher medium-term (3 to 7 years) overall survival rates than did metal posts when used in the restoration of endodontically treated teeth with no more than two coronal walls remaining. Objective: Root canal obturation still is a relevant research topic and patients spend substantial amounts of financial resources for this step of endodontic treatment. Three experiments were conducted challenging the necessity of root canal obturation. Method and materials: Applying micro computed tomography, the volume of dentin tubules that cannot be instrumented during root canal therapy was determined. Using a simple biofilm model of human tooth segments, the effect of root canal obturation on the persistency of bacteria was evaluated and freshly extracted root canal treated teeth were examined for bacteria remaining in dentin. Results: The volume of dentinal canals was found to be at least three times greater than the volume of the root canal itself. Bacterial growth was observed both in specimens with and without root canal obturation implying that the treatment rendered was ineffective in removing bacterial biofilm and the obturation material was incapable of hindering bacterial regrowth. Conclusion: Despite showing adequate root canal obturation radiographically, persistent bacteria could be identified in all teeth extracted. While perfect disinfection of root canals is mandatory, root canal obturation seems questionable as current materials have no antibacterial activity, do not stabilize the tooth, and cannot seal the canal system if a coronal restoration is missing. Objective: This study investigated the effect of framework design and modification of porcelain firing cycle on the occurrence of fractures of metal-ceramic and bilayered zirconia crowns after cyclic loading. Method and materials: Twenty-four zirconia crowns with two different apicocoronal incisal veneering porcelain lengths (ZS = 2.0 mm and ZL = 4.0 mm) were fabricated. Twenty-four metal-ceramic crowns with the same apicocoronal incisal veneering porcelain lengths (MS = 2.0 mm and ML = 4.0 mm) served as the control. All the specimens (n = 48) were thermally and mechanically cycle-loaded (49 N) for 1,200,000 cycles, and then evaluated for cracks and/or bulk fractures with an optical stereomicroscope (×10). In the second part of the study, the influence of firing cycle modification on the success rate of twenty-four bilayered zirconia crowns was also evaluated. Finally, two specimens from each group (n = 12) were sectioned and analyzed using a scanning electron microscope. Load-to-failure of the specimen that did not present bulk fracture was further assessed using a universal testing machine. Statistical analysis was performed with Fisher exact test and Kruskal-Wallis test. Results: A statistically significant lower occurrence of fractures (P < .05) was found after cyclic loading for bilayered zirconia versus metal-ceramic crowns. Modification of the firing cycle did not significantly influence the outcome after cyclic loading for zirconia bilayered crowns (P > .05). Conclusion: Within the limitations of this study, porcelain-firing cycle with an extended cooling time did not appear to influence the occurrence of cracks and fractures of bilayered zirconia crowns. Petrovic, Ivana / Ahmed, Zain Uddin / Matros, Evan / Huryn, Joseph M. / Shah, Jatin P. / Rosen, Evan B. Successful intraoral rehabilitation for patients with head and neck cancer can be extremely challenging to both the patient and the physician due to anatomical, functional, and esthetic changes from the cancer and its treatment. The measures with optimal oral hygiene to prevent or minimize the sequelae of cancer treatments are fundamental to preservation of function and avoidance of complications of therapy. In patients with loss of teeth, endosseous (dental) implants offer an option to improve intraoral rehabilitation. This review presents the indications, problems, and relevant issues pertaining to the use of endosseous implants in a head and neck oncologic population. The problems associated with the traditional approaches for cancer treatment including surgery, radiotherapy, and chemotherapy, as well as those with antiresorptive medications are discussed as they relate to consideration for endosseous implants. This information can aid dental practitioners to select appropriate candidates for implant surgery, minimize postoperative complications, and maximize the successful oral rehabilitation of this patient population. Brooks, John K. / Kleinman, Justin W. / Lubek, Joshua E. / Price, Jeffery B. / Ghita, Ioana / Scurnick, Steven A. / Basile, John R.
Squamous cell carcinoma (SCC) is an aggressive tumor and represents the most common oral malignancy found by dental health care providers. Timely detection is paramount to reduce patient comorbidities of regional and distant metastases and improve survival rates. To augment recognition of early stage of gingival SCC (GSCC), this article features the somewhat innocuous clinical findings in a 60-year-old female. Mupparapu, Mel / Kothari, Karaan Raj M.
Disinfection is a crucial aspect of patient care in dentistry. In the pre-19th century era, natural elements like acids, sulfur, mercury, and various alkaline metals were valued for their ability to obliterate pathogens. More recently aerosols, sprays, and disinfectant wipes with more powerful chemicals including quaternary ammonium compounds and aldehydes have become popular. As aerosols fall out of favor due to their health and environmental risks, disinfectant wipes are becoming the most trusted form of clinical sanitization. This article explores the history as well as the current practice of disinfection in the dental profession and further explores the variations in the use of surface disinfection based on the published literature. The current practice guidelines as recommended by agencies like Centers for Disease Control (CDC) were studied and summarized for this review. Turhani, Dritan / Ohlmeier, Kai Henning / Sutter, Walter / Kielbassa, Andrej M.
Background: Bulimia nervosa is an eating disorder resulting in an intended weight loss due to decreased food intake, induced vomiting, or hyperactivity, and is observed frequently between 12 and 25 years of age. One of the complications is early tooth loss. Moreover, since bulimia nervosa patients suffer from increased atrophy of the alveolar processes, oral rehabilitation even with short dental implants may be impossible. In these cases, lateralization or transposition of the inferior alveolar nerve (IAN) followed by implant placement can be useful. Case presentation: A 40-year-old woman with a long-lasting history of bulimia nervosa requested a fixed rehabilitation of her partially edentulous mandible. In 2012, a bilateral IAN transposition approach was performed using piezosurgery, and without any postoperative neurosensory alterations. Two years later, bilateral insertion of each two implants was followed by an inflammatory destabilization of the lower left mandible; subsequent to the implant removal, a fracture occurred, and the latter was stabilized by osteosynthesis plates. In 2017, three additional implants were placed, finally providing the patient with a fixed restoration on five implants. Conclusion: Eating disorders may have a tremendous impact on both physical condition and oral health, resulting in early tooth loss and severe bone atrophy. IAN transposition is a viable treatment option to enable installing fixed prostheses via dental implants, but the latter will clearly increase the risk of inflammation and interruption of mandibular continuity. Close clinical and radiologic monitoring is mandatory to adequately respond to complications such as peri-implant mucositis, peri-implantitis, osteomyelitis, or concomitant fractures. Objective: The purpose of this study was to find a reliable method to reproduce biting pain to facilitate an early diagnosis of cracked tooth and to verify the feasibility of the Tooth Slooth in diagnosing a cracked tooth. 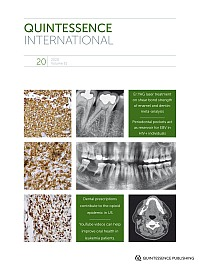 Method and materials: In this study, 46 intact teeth diagnosed as cracked teeth were selected. Patients were asked to bite wet cotton rolls and the Tooth Slooth, and clinical findings were recorded. The difference in the relevance ratio between these two bite test methods was determined. Results: The relevance ratio of biting pain by the Tooth Slooth and wet cotton rolls was 91.3% and 32.6%, respectively. There was a statistically significant difference between these two bite tests (P < .001). Conclusions: Within the limitations of this study, the relevance ratio of biting pain by the Tooth Slooth was significantly higher than that of the wet cotton rolls. The Tooth Slooth was a reliable method to reproduce biting pain and was useful for early diagnosis of cracked teeth.